Building Workshops to Realize the Top 40 Design Entries: September 2017 to March 2019. Nka Foundation invites submissions from creative practitioners and institutions dedicated to community placemaking to participate in its 2017 Land Art Competition. The competition is open to landscape architects, artists, curators, designers, architects, urban planners, engineers, university students and others from around the world to submit their ideas for large-scale and site-specific public art installations based on site in rural Ghana. In order to enter the competition, you must register here: www.eventbrite.com/e/27345887285 . Once you have registered, you will need to submit your design entry on this board: goo.gl/7AIHym . As noted, we plan to organize international workshops to build and install the Top 40 Entries to the 2017 Land Art Competition, as site-specific public art in Ghana. 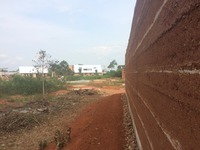 The physical location for the construction workshop and installation of your design entry will be the Abetenim Arts Village in Abetenim, a rural community near Kumasi in the Ashanti Region. 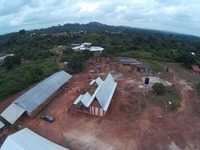 The Abetenim Arts Village is developed by Nka Foundation in Ghana. Throughout the year, Nka Foundation organizes international earth architecture workshops and artist workshops that welcome participants worldwide to immerse themselves and practice in the local Abetenim environment. In general, our workshops invite university students, graduates, working professionals, and retirees to immerse in the local lifestyle and learn-by-interaction with the people through engagements at the arts village, the local schools or other spaces for cross-fertilization of knowledge and skills. Students can use the opportunity for internship, thesis or personal research. Our rural arts village projects thereby provide our international participants with time away from the everyday stresses of city/studio life to focus and investigate own practice, creating the possibility for discovery, collaboration and growth. At the present, the Abetenim Arts Village has an openair theatre, workspaces and 9 guest houses for your accommodation. Most evenings will be used for reviewing workshop progress along with artist lectures, impromptu performances and presentations by workshop participants. By alternating work and dialogues, we anticipate cross fertilization of ideas. Nka Foundation is a nonprofit organization in the United States that exists to serve underserved communities in Africa. We do this by creating a network of project sites in the underserved communities where individuals, groups and institutions across the globe can come to immerse and interact with the needy communities to build cultural bridges for skills and knowledge transfer. Since 2008, Nka Foundation has been running arts and mud house design projects in Ghana, Mali and Tanzania with a focus on the “tapping local resources for sustainable development”. Nka Foundation projects promote volunteerism. The works of the Nka Foundation began in 2005. From 2008 through 2010, Nka organized workshops and symposia in partnerships with some universities in Ghana and Mali to stimulate conversations and artistic interventions for solutions to the problem of tapping of the abundant local resources for sustainable development in sub-Sahara Africa. By 2009, we felt a deep need to create a model arts village at Abetenim that can be replicated in other parts of Africa, to continue to address the problem through design-build workshops, arts workshops, design competitions and outreach to the local community by means of building projects and education enrichment. Today, Nka Foundation is building a network of arts villages, starting in Ghana and Tanzania. The arts village is designed as a learning center to provide relational spaces for creative people from the region and other countries to live, work, learn and create. Nka’s rural projects therefore draw on asset-based approach to community development by immersion in the rural community and by the mobilization of existing, but often unrecognized abundant local resources to enable the underserved community drive its own development process. (1) An individual or a design team can submit an entry to the 2017 Land Art Competition. Each team shall identify one team member as its Point of Contact (“Point of Contact”) during the submission process. Each entry shall receive a registration number and, from then on, will only be identified by that number, in order to keep anonymity during the submission and the final election. (2) In order to enter the design contest, you must register here: www.eventbrite.com/e/27345887285 On your Eventbrite ticket, you will see a 9-digit order #. This is your registration number for one design entry. If you are submitting more than one entry, each design entry requires a separate ticket. With your entry ticket number upload your design entry to this page: nkaprojects.boards.net/thread/63/submitted-entries . If you want to pay by check, send us an e-mail at info@nkafoundation.org / www.nkafoundation.org and the following information: Team Name, Team Leader, Name, Phone Number and Email for Each Team Member. To submit your design, place your ticket number and the title of the project (no name) on all pages of your design submission to allow the jury to select blindly. (3) SUBMISSION FORMAT: Submission will be Online, to be uploaded to nkaprojects.boards.net/thread/63/submitted-entries. It should include: (1) The design statement (200 words max) should include the meaning of the work, material description and budget in USD; and (2) One A1 presentation board submitted as a JPG file of high resolution (1 MB). The upper right corner of the board must contain the entry ticket number. There should not be any marks or any other form of identification, less the entry is disqualified. The file must be named after the ticket number. For example, 112334567.jpg (for your presentation board). Submissions must be in English language. (4) Of the nominated projects (40), there will be three winning projects, according to the highest scores. Jurors will award prizes for first, second and third place consisting of a commemorative certificate and cash prizes to the winning designs as follows: 1st prize- $1,000 or Construction of design in Ghana plus a trip to Ghana for a workshop to build the winning design (in case the winner does not reside in Ghana and to a maximum of 1 person); 2nd prize- Construction or $700 and 3rd prize- Construction or $400. Honorable mentions will be awarded by the jury but will receive no cash prize. Every design team that makes the Top 40 Entries shortlist will be offered the opportunity to build their design at Abetenim in collaboration with the project organizers. If a design team of the Top 40 Entries is not able to lead the workshop, the team may nominate a practitioner or an organization who is able to lead the workshop to build their entry. Otherwise, the organizer of the contest will pass the opportunity to another team whose entry in the competition is a good fit for the project site. (5) Judging criteria involve: (1) Functionality: As a land art design; (2) Form: Visual appearance through use of materials, shape, color, texture, etc based on the intended function of the work; and (3) Technical issues to the degree the work addresses construction techniques, climatic factors and construction budget. Decisions of the jury will be final and binding. (6) Q&A: Registered participants may post questions for organizer to respond to and you can share materials on the competition discussion board: nkaprojects.boards.net/thread/62/2017-land-art-competition. The deadline for questions is January 31, 2017. (7) Any person entering this contest shall certify and guarantee the organizers that he/she is the sole author of the project and by participating, each contestant grants their free and exclusive consent that all designs and ideas will be published and shared to inspire others. By entering the competition, all participants agree to all the conditions of participation in the competition. (8) After, you have uploaded your entry Online, send us a note via email via info@nkafoundation.org / www.nkafoundation.org that include the following information: the entrant’s personal information including your name, registration number, profession, address, and email address. “A form of contemporary art, known also as Earthworks, or Earth Art, this artistic movement emerged in America during the 1960s when a number of sculptors and painters - such as Robert Smithson (1938-73) - determined to heighten public awareness of Man's relationship with the natural world by intervening in the landscape in a series of thought-provoking constructions. These (frequently massive) land-based interventions or artworks took a variety of forms, from large-scale land artworks like man-made curtains reaching across vast stretches of landscape, the encirclement of whole islands in coloured fabric, and reshaped waterways and volcanoes, to simple lines of footprints in the earth. Thus, in this project, we define a land art broadly to include earth art, earthworks, environmental works and other artistic works, designed for a particular outdoor location. - Land art can be create directly in the landscape by sculpting the land itself into earthworks. -Some land art are not created and placed in the landscape, rather, the landscape or natural conditions such as weather, fire, or air are the means of their creation. The purpose can be to heighten public awareness of Man's relationship with the natural world by intervening in the landscape. - Land art may also be a site-specific artistic work done and installed on land using natural or synthetic materials that works in harmony with the given location. The work can be created with materials from the environment such as soil, rock, wood, water, or through use use of natural elements such as kinetics of air/wind, or by creation of an aquascape with water/rain and generating works by use of light (fire/solar/lunar). Here is a video that shows you an example of a wind harp, it is a metal work that relies of natural wind in creating sound as the wind passes through the metal tubes. Antonio Manfredi is an artist and curator/director of Casoria Contemporary Art Museum (CAM Museum) at Naples and President of International Contemporary Art Center at Casoria in Italy. He has exhibited his works in more than 300 solo and group exhibitions worldwide. His monumental sculptures in marble, iron and wood are in collections in China, Egypt, Europe, Russia and US. In 2007 Manfredi was chosen by the Italian Ministry for Foreign Affairs to realize a sculpture to commemorate the Italian-American victims of the Twin Towers in New York. As Art Director and curator, Manfredi has organized numerous international exhibition projects in cooperation with international public and private bodies by discovering and selecting artists from around the world for the permanent collection of CAM Museum. Manfredi has been the director of CAM Museum since 2004. Ingrid Lenz studied Technical Writing at Hochschule Karlsruhe – University of Applied Sciences and finished in 2009. Since more than 7 years she works as chief editor in technical writing for different companies, but also as an independent editor. Besides that, she is interested in different cultures, and therefore travels a lot. She participated in the workshop in Abetenim, Ghana in 2015 and joined Raumgeschichten e.V. afterwards. Robert van Kats is co-founder and architect partner of Blok Kats van Veen architects (BKVV). BKVV is established by Dieter Blok, Robert Kats and Sander van Veen. The head office is located in Amsterdam, the Netherlands. The office acts on the business, governmental, NGO and private market both national and international with a specific focus on the African market specialised in sustainable architecture, urban planning, master planning, urban design, and building related energy concepts. The main speciality is SPATIAL ENERGY DESIGN. BKVV introduced the concept 'Spatial Energy Design' which became a design methodology for architecture to create buildings that are comfortable but with a extreme low energy demand and a high level of self sufficiency. A shared vision based on physics via the integration of engineering, economics, culture, climate and architecture for the production of contemporary and sustainable architecture. We transfer ideas into a concrete spatial design and bring this to realisation. A selection of projects are the Sustainable University Campus Mouila Gabon icw Maïssa architectures (Ministry of Education), Ramses Park Cairo (National Organization for Urban Harmony), Sustainable Low Cost Butterfly Housing South Africa and Nigeria, Hospice Chipata Zambia (Chipata Foundation), Lofthome®, the Sustainable CO2 neutral Bridge Control Centre for the province of South-Holland, the Spatial Energy Design Study for passive cooling for buildings in South Sudan (USAID/ Aecom International), the Makoko Floating School Lagos Nigeria (icw NLÉ, Kunlé Adeyemi), Wingfield Urban Development Cape Town South Africa (Tyger Design Lab/ DASUDA), Kaloleni Urban Development Nairobi Kenya (County of Nairobi/ University of Nairobi/ DASUDA). Robert van Kats is co-founder of the foundation DASUDA, Dutch Alliance for Sustainable Urban Development in Africa. Robert van Kats is the Chairman of DASUDA. Kats is Board member BNA International at the Royal Institute of Dutch Architects and Member of the Scientific Committee for the International Union of Architects World Congress August 2014 Durban South Africa. Sabine Tastel studied Architecture and Urban Planning at Karlsruhe University / KIT and at Istanbul Technical University. During her studies, she focused on the urban and social revitalization of inner city districts whose boundaries lack identity and which show spatial isolation. In 2014, she received her diploma investigating the restructuring of the Magdolna Quarter, one of Budapest’s underprivileged districts. Before working at planquadrat – elfers geskes krämer in Frankfurt and teaching international urbanism at KIT she worked at bb22 architekten + stadtplaner and several offices in Karlsruhe and Berlin. She is founding member of Raumgeschichten e.V.